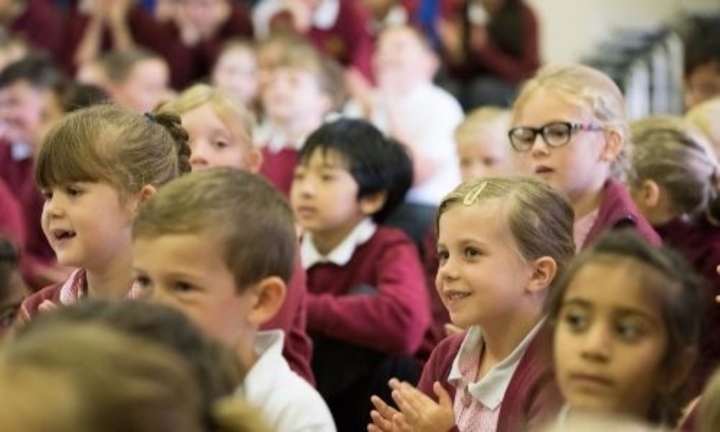 Cuddington Community Primary in Surrey has achieved Flagship status. A great deal of developmental work has taken place in the last year since the IQM COE review. There were a lot of staffing changes in the previous academic year and since then the school has been able to move forward in introducing and consolidating whole school strategies, for example, in terms of behaviour and teaching and learning. Work on values has been very positive as has the development of the ‘growth mindset’ approach throughout the school. Major changes have also taken place at lunchtimes to provide more structure and monitoring at this time. Attendance has also been a key focus with the school trying hard to encourage high attendance and to discourage parents from taking holidays during term time. The school works closely with parents to improve attendance for targeted children and is prepared to phone them every morning if it means they are able to get their children into school. The work of the PSA has also continued to develop this year with fundraising taking place for charities as well as for school funds. The ELSA supports this work and ensures that many parents support events at the school. Communication has also improved this year through the use of social media, which parents find very useful. The school listens to its parents and does its best to find ways in which they can be helped by the school and in return parents help the school through volunteering and participation in school events. The work of the Inclusion Manager in leading the work with parents is very important, ensuring that parents know they can ask the school for advice and support when it is needed. A group of parents I met on the day of my visit spoke very highly of the school and of the exceptional support given to their children with SEND. Comments made by parents included, “They are smooth, calm and professional when issues arise. I won’t have a bad word said against them”. A parent spoke of the wonderful support she has received for her child with SEND in the ‘Jubilee Centre’. She mentioned the huge difference the centre made to him and how his personality has changed even at home, “He is a lot calmer and he is much more confident. He even put his hand up to ask a question when we went to a football club for a visit. She mentioned how friendly the other children are with him and she notices how they call to him and say hello. She has been very surprised by what her son has managed to achieve, things that she hadn’t thought possible, for example, he is keen to go on a school journey, “He sang on stage and knew all the words, I didn’t think he would be able to do that. They have very high expectations of him – they go at his pace and they keep on trying. He used to not speak at all and now he won’t stop talking” This is as a result of the school’s excellent work to ensure they got to the core of the child’s needs and as a result he had a diagnosis of oral dyspraxia. She is also delighted that the school encouraged him to do ‘street dance’ as a lunchtime club and he loves it so much that he even goes out to a club in the evening – something else that has really surprised and delighted his mother. She likes the way the school and parents work together on the children’s targets, “We work them out together and then we do them together. We are immersed in the targets. At the moment it’s folding paper, something the teacher noticed he can’t do yet”. Another parent spoke of the efforts staff have made to ensure her son who struggles socially has begun to talk about school because of the school being very sensitive to his needs and has, for example, put him in a quiet group to work, “I feel confident and comfortable with him here. Everyone is special and is catered for in all the classes. They know what suits each child, it feels right, it’s not them and us: if a child acts differently to other children they understand and accept”. Parents also spoke of how all the children are together at lunchtimes and play very well together. They are all in the lunchtime clubs and cooperate very well together. “All the children in the school know each other and they are all very accepting of differences. The buddying system is excellent”. Parents also mentioned the excellent support with transition that they are given and one parent of a child in year 5 is already receiving help re transition for her child with SEND to secondary school. Another excellent development of the school’s close work with parents is that parents give each other support as well, thus strengthening the school/parent partnership. The school continues to work in close partnership with parents. This year the school has continued to offer workshops for parents on various aspects of the curriculum, such as Singapore Maths and Phonics as well as one on attendance to highlight this important issue. Singapore Maths is now in its second year of development with very positive responses from both teachers and pupils. This is supported by a learning community for staff enabling them to share ideas re methods and to discuss issues around the scheme. The training of TAs to lead on interventions, including ‘Boosting Reading Potential’ and ‘Success at Arithmetic’ has also been very successful in ensuring children are given the additional help they need. The work of the school’s resource base, the ‘Jubilee Centre’ has gone from strength to strength with most children being integrated into mainstream classes for part of the day. The school’s ELSA plays an important role in the school, providing social and emotional support for children and parents whilst supervising and organising the lunchtime arrangements. This year there has been a big development in lunchtime provision: all children are now placed in clubs every week and children with SEND are fully integrated into these clubs. The ELSA organises the children into the different groups and she gives a great deal of thought to which clubs might suit different children. She ensures they have a variety of experiences and that children with SEND are able to shine and to develop their skills in a very safe and secure environment. The school employs coaches to lead a variety of sports’ clubs, including multi skills and football, which are proving very popular with children. All the clubs are free of charge and children can mix with their peers from different year groups, which further strengthens the children’s relationships and the inclusive ethos of the school. The result of these new arrangements has been very positive with pupils enjoying the clubs and with all pupils benefitting from the additional space available for play. A behaviour code has been introduced for play times, which has also helped to improve unstructured time and midday meal staff have felt more valued through the responsibilities they are given and the fact that they now are included in the school’s performance management system. Because of this focus on the organisation of lunchtimes, behaviour has improved and children are more able to manage themselves and are learning how to engage purposefully during unstructured time, “All time in school is learning time”, commented the ELSA. The school has very high expectations of its pupils who are nurtured and cared for on an individual basis by all staff. Their needs are addressed, they are listened to and respected by the school, which has developed an inclusive ethos of mutual support. As a result, children are very caring and respectful of each other: they all know and support each other and collaborate very well together. A group of pupils spoken to representing all year groups, were keen to describe their learning and why they like their school and the rich opportunities it provides for them. They were a real credit to the school with their enthusiasm and love of the school. They were able to describe how they learn and what helps them, as well as expressing the other factors that make the school very special for them. They were self-confident, articulate and were able to enter into mature discussion with ease. Pupils clearly enjoy learning and they explained how the teachers encourage them and make learning enjoyable. Comments from pupils about their school included, “We take care of people: if someone is hurt they have a buddy”, “On my first day I was very nervous but then I got 2 buddies who played with me. They were very nice and then they helped me to play with lots of children, so I felt very welcomed”, “My teacher explains twice so we understand. She helps us and encourages us to be creative and to use different ways of learning”. They are also very clear on the different aspects of learning that they are trying to develop, “We get rubies for being ready to learn, for resilience we get diamonds, if we’re adventurous we get sapphires and it’s a green stone if we’re collaborators and make a good team effort”. Children were able to explain these features of learning in more detail, “I was working well in Maths and so I got a green gem. We wait for someone if we’re working in a team and we’re patient with each other. You get a sapphire when you’re digging deeper and you’ve thought of something that no one else has thought of, for example, in Maths if we know a different way to solve a problem, we tell each other so a sapphire is for something new”. They explained with enthusiasm how the gems are put into pots and lead to team points at weekly assemblies and finally to a winners’ trophy. Children were also very keen to explain the school’s values that they focus on every half term, “ Creativity is about having a growth mindset and trying to find different ways of doing things”, “We also have values of confidence when you put your hand up to have a go and tolerance by respecting someone’s religion or what they believe”. They also explained the new lunchtime arrangements, which they are very happy with, “We have superstar helpers in the lunch hall, children in KS2 help the younger ones. We love the new clubs at lunchtime, street dance is great and so is gymnastics, I am going to do this in and out of school club as well because I like it so much”. When summing up what they like best about their school they commented, “I love the way we work together. It’s really nice and I like playing with my friends”, “It’s probably one of the friendliest schools in the world”, “The teachers are very kind. If you don’t understand they will go over it again and my friends are very kind to me”, “All the children work very hard to do all the things we are asked to do. We do our best at everything”, “My teacher is amusing and encourages me to be creative and to find different ways of doing things”. Pupils were very impressive in articulating the school values and the learning approaches enshrined in the growth mindset strategy and they have clearly absorbed the school’s priorities and do their very best to implement them daily. Teaching and support staff work well together to meet the needs of all children in their groups. Lessons are planned in detail, ensuring they are interesting and challenging for everyone and there are imaginative and exciting activities planned for pupils. Features of lessons visited on the day during a learning walk, included excellent behaviour in all classes; beautiful displays to support learning and to ensure consistency in learning, including working walls and ‘The treasure of learning’ gem stone display in the main hall; guided reading in groups; calming down activities prior to break; learning intentions on display in all classes; an HLTA leading a year 1 class; reception children doing exciting work around Knights, Kings and Queens, including Maths, role play, art work and language work; paired work in year 5 on food in Tudor times. Another noticeable feature was the excellent integration of pupils from the Jubilee Centre into lessons. Support staff were leading intervention groups including one-to-one work in the library/ICT suite and an HLTA was leading a lesson in year 1. A visit to the resource centre highlighted the very secure nurturing environment for the children, who are also integrated into mainstream lessons where appropriate. This is a reflective community where very interesting developmental work takes place to ensure strategies meet the needs of pupils. On a wider level, the school works closely with the other school in its academy group, on various aspects of CPD and sharing good practice. This enables staff at all levels to develop their skills and expertise. Networks on aspects of work such as assessment, safeguarding, behaviour, attendance and inclusion also ensure that ideas can be shared and strategies developed. As a result, the 9 schools in the trust are able to keep their unique features while having support and consistency around strategies and systems. The school continues to disseminate its excellent practice for children in the ‘Jubilee Centre’ to a range of visitors from other schools, who come to learn strategies that they might introduce into their schools. The school also works closely with a local special school to share good practice and to integrate children from the special school into mainstream where appropriate. This close working relationship enhances the school’s expertise on children with SEND. The school continues to work hard on its strategies for children with ASD both in the mainstream and in the Jubilee Centre with a view to achieving the ASD award in the future. The school is continually developing its excellent practice on inclusion and is sharing its practice with other schools. The next review will look closely at how the school has interacted with its Inclusion Cluster and promoted continuing outreach. I am of the opinion that Cuddington Community Primary School meets the standard required by the Inclusion Quality Mark and I recommend that the school moves to Flagship status. The Flagship period will run until the end of academic year 2020-2021 assuming successful annual reviews each year.